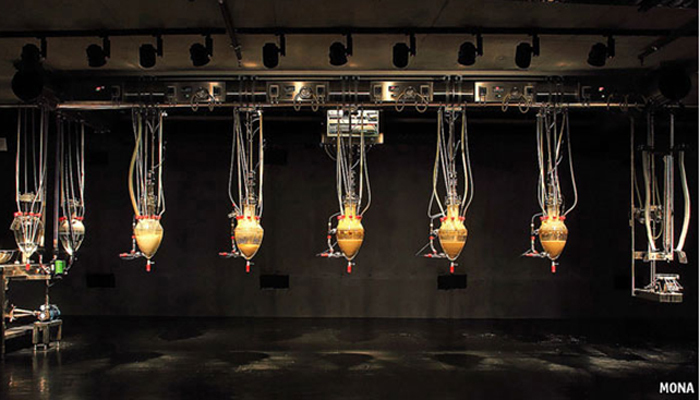 Wim Delvoye's "Cloaca," better known as the "poo machine." Photo courtest of MONA. I was going to get a tour of MONA from Delia Nicholls, a delightful research curator, but when she came to greet me she told me that she only had an hour or so and then had to go to a funeral for an old friend, another art patron. So instead of walking around, we sat down at the museum’s wine bar for a light lunch and some conversation. I like Delia. She’s very up front. For instance, when I originally talked with her, I asked if I might be able to meet the museum’s owner, David Walsh. Since I don’t particularly like people either I was sympathetic. She then hurried off to her funeral and I hurried off to see what she and others call the “poo machine,” an installation by Belgian artist Wim Delvoye properly titled “Cloaca,” that simulates the human digestive system. Regular food is shoveled into a long, transparent mouth, travels through a number of agitated glass bowls, and ends up as turds which are pushed through a cylinder and onto a plate promptly at two every afternoon. Never thought I’d be asking that question. The attendant got on his two-way radio and reported to someone upstairs that no turds had come from the poo machine. A crackly voice on the other end told him to stand by. A few minutes later, two middle-aged women in museum uniforms turned up. Everyone, including me, stared at the poo machine. “It didn’t poo at all?” asked one of the women. “I don’t think so,” said the tall blond attendant. “Did anyone see any poo?” he asked those of us standing around. We all shook our heads. “Very unusual,” said the woman. And with that I went off to see what else was of interest in the museum. I suppose poo machines aren’t in the collections of major national galleries in capital cities because with all the politicians about it would be redundant. But when it clogs can’t they give it some sort of arty laxative to make it function again? How did they get it to poo again?